I am about to dump all sorts of things on you guys – road trips, shopping results, family events,a little DIY, and of course, knitting. Sorry to have been gone so long, but I will get you caught up with what I have been up to! First off – the beaded lights project. I wish I had a before photo for you – but let me describe, instead. 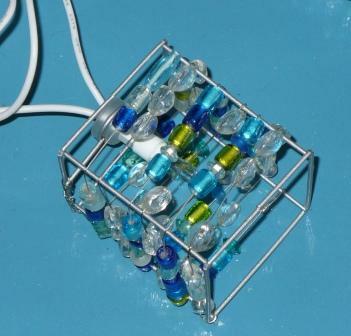 The original string of lights had the square frames, wrapped with clear beads strung on a wire. I collected a variety of strings of colored glass beads, divided them evenly by the number of lights I had (10) and strung them on beading wire. I attached that to the frame, and then just wrapped between the rows of clear beads. 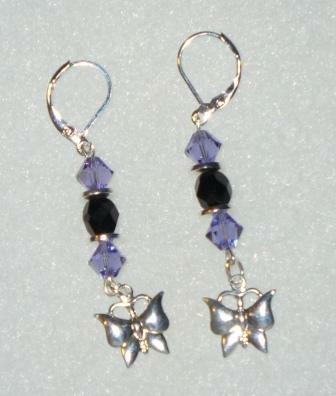 It took about three hours to complete, but I think they are a lot prettier now, and more fun. I hope to hang them on the screened porch, but I might put them in the dining room where the door to the porch is, so I can see them inside and out. Next up – travel! 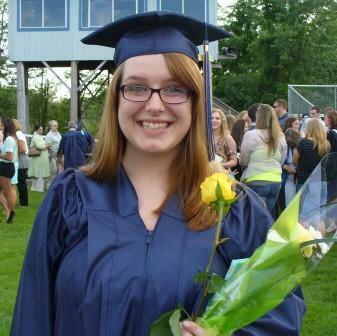 Niece C the younger graduated from high school in CT last Friday evening. 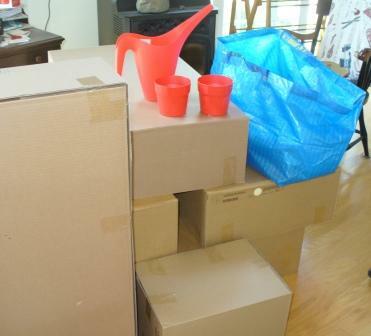 Mom and I drove down, went to the celebration, stayed over night and hit IKEA before we drove all the way home again. It was a long two days, but worth it in so many ways. I am so proud of this girl – she works really hard at school, and it has paid off, she won three achievement awards, in Business Marketing, Chemistry and Pre-calculus. Plus, she is just NICE. 🙂 I am not too prejudiced. 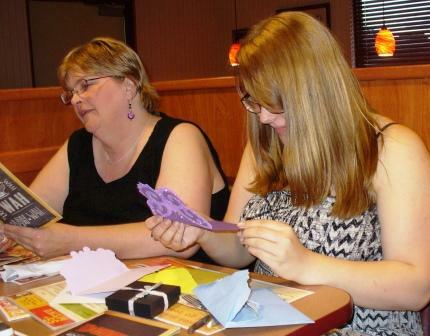 I love this photo of her with her mom, and not just because she is opening the card I made her. 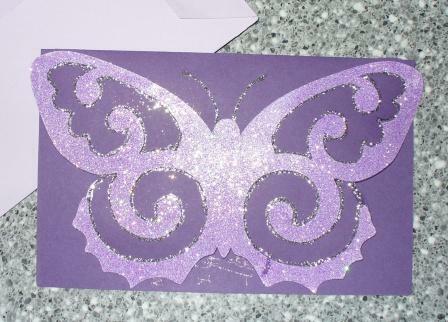 Although, looking at it, it is a better photo of the card than I took at home that morning! On to IKEA. I went with the intention of getting 6 dining room chairs and whatever else caught my fancy, within reason. But they opened later than I had hoped (10) and Mom and I had a long drive ahead of us, so we literally RACED through the store. Got the chairs – I’ll have photos of them another time – and got the lights and candles and things I wanted but did not get to dig around the marketplace as I had hoped to. I was able to pick up a few things for my neighbor’s birthday in August, and I got a rolling cart to hold knitting things which now take over the coffee table. I don’t like the color, but I will spray paint it and make it unique. And then A attacked the boxes and created this cat heaven. 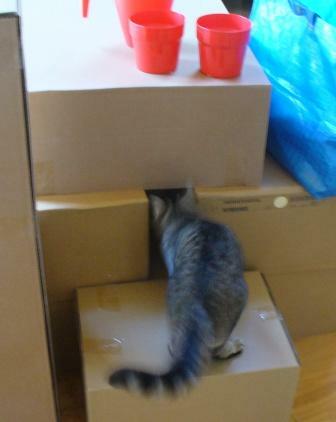 They never use it in front of us, but in the night we hear them, and each morning, the boxes are in disarray. I hope it is not a permanent installation in the living room, but you just never know around here. So. I didn’t knit much last weekend, as you can imagine! A road trip is usually good knitting time, but A didn’t come with us, so I did the driving. However, some progress was made on the green and purple socks, and the dropped stitch scarf. I kept up my Socks with Sarah commitment, even though Friday and Saturday I think the “knitting some every day” was literally less than a row. I am on the home stretch with this pair now, just have a couple of inches left on the second sock to do. The scarf is made with some yarn I dyed using black cherry Kool-Aid and the crock pot. I really experimented with different small bowls with different amounts of the same dye, to get a variegated yarn, and I am pleased with how it came out. So, that’s it – my week or so in review. Now, I have to go tackle some of the other things on that Friday list of mine. And of course, I have a lot of blog reading to catch up on. Let me just go grab a cup of coffee. It’s a crazy list today – not sure how I will get it all done, or if I will. But I’ll get the important parts done, and the rest will live on in a Saturday or Sunday list. I have an eye doctor’s appointment at 2:30, so I know any detailed vision work has to get done before they put those darned drops in my eyes! Plant the mountain laurel and the potatoes. Really, this week I will do it. Work on pool excavation, it is going to become crucial soon, I think. Post photos and last week update. Bet you all wonder where I was and what I was up to, right? Knit a sock… or at least a few rows of one. I think that will keep me pretty darned busy today. I’d like to go to Stonington to the farmer’s market, but I don’t see how I can do that and get this work all done… maybe in July I will get there. out to dinner and to the new Cross Center to see Cirque de Soleil! I have never seen them, and am quite excited about it. This is what A wanted for her birthday in April, how nice that I bought myself a ticket for her birthday as well. 🙂 Her sister L is coming along too, as her (August) birthday present. We will have a great time! Friday morning, I will hop in that BIG rental car, go pick up Mom, then drive 400 miles to Connecticut to see niece C graduate from high school. She finishes up along line of nieces and nephew graduations that we have traveled to – next one is little niece E, who is 7. 🙂 A has a great-niece who will graduate next year, but she is close by, and we are likely only going to the party piece of things. But for young C, we are invited to the actual event, which is an honor as there are limited tickets. It will be hot, and hopefully not raining, so we can be outside. I will bring a hat and umbrella for shade, and hope it doesn’t go on for hours. I will be knitting on my socks, too. Never too hot for socks! Then it’s time to hit the road, so we will get home sometime Saturday evening. It will be along crazy couple of days, but it will be fun, and I will get to have quality time with Mom, see two nieces, get new furniture, what could be better? I did most of the Friday list, except I never really got to the yard work, unfortunately. Yes, I took some photos of things, but I am too lazy tonight to get them off the camera and post them. They aren’t going anywhere, so you will see them eventually. However, the craft room got lots of attention this weekend – loads of trash carted out, and lots of flat surfaces cleaned – but not all. Crimson Crow, dear friend that she is, gave up a whole Saturday to keep me on track and focussed. I went through deep piles of papers and STUFF that was on the counter and the tables. We did not get into cabinets and drawers, but we made really good progress on the clutter that piles up on things. To the point that we were able to fold and put away two 6 foot tables. I have to deal with paper when it comes in. If I leave it on the kitchen table for “later” A will eventually get fed up and put it on the counter in the craft room, where I will be able to ignore it for a long time. Eventually, the room will be so full I will only have a small area to work in. I say this because I just spent the day sorting through papers that have been up there for nearly 5 years. Yikes. I knew I hated filing, but I didn’t realize how much. I did start to go through some fabric bins, and as a result, I have a large pile for GoodWill, and I do believe I have some give away here. When I get everything sorted and laundered, I’ll get some photos of it and see who wants it! We did not touch yarn or paper, and the room is far from clean, but I feel like we made super progress. In a few weeks when I have a free weekend, I will go send more time up there, as there are still two lengths of counter and a desk that have a little clutter – not like what we got through this weekend, but not ship-shape, either. Did a little knitting, a little crocheting this weekend, not much, but I did keep up with the Socks with Sarah commitment – a row or two only, but still worked on socks! And did a few more sock scrap squares. One thing I did do, and which I will share photos of when I stop being so lazy, is a beaded light project. I bought a string of lights (ten lights) that had wire cages wrapped with clear beads on each light. 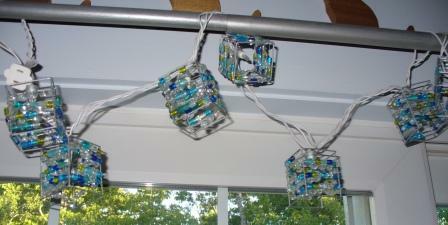 I intended to make a hanging light by wrapping these lights around a wire ring, and also adding colored beads to the cages. Well, that project has had all its parts ready for a few months, and been sitting on a counter in the craft room. Today I decided to just do it already! Bet you are dying to see my camera now – not just socks today! PS I also made a present and a card for my graduating niece, I’ll take photos of those before wrapping, but can’t show you until she gets them. PPS A’s sisters came over Saturday and brought with them many cakes and cupcakes in various sizes made from my favorite recipe – Mom’s mocha cake and frosting. Yum. I love when a birthday lasts for a week! That really is all – off to bed so I can start the new week refreshed and rested. Clear off the tables in the loft and sort some of the craft room stuff onto them in prep for the big cleaning on Saturday! Can’t wait! 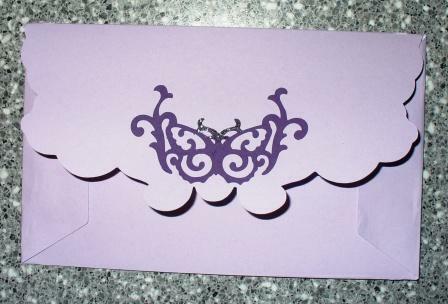 There also is a graduation present to make for niece C, and a card for her as well… not sure how I will do that – might wait until Sunday, actually for the card. 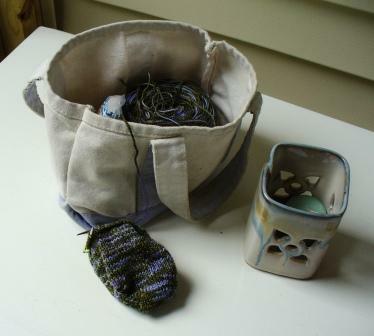 and then there is sock knitting… and photos for you of the things on which I am working. There are a few! 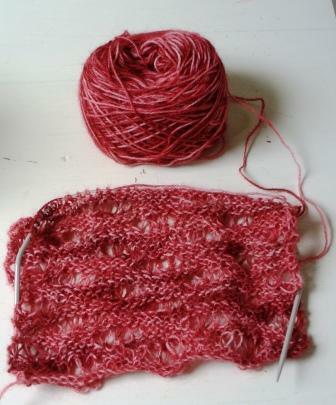 I finished the business casual socks in Ginger, and have started a new pair, number 14 – ! which will have a plain foot but a fancy leg, worked over my favorite 60 stitches. 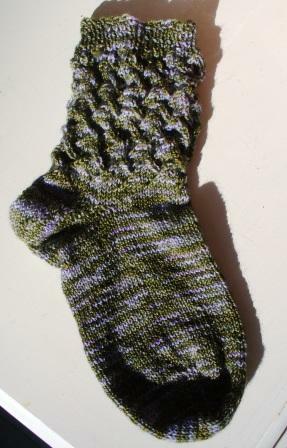 The yarn is called Lichen, and is shades of green and purple. Tosh sock, of course. 🙂 The ginger socks came out well, the pattern went really fast doing it one at a time, and I think they will be so cozy and warm AND stylish this winter. I just hit send on a job application. I haven’t applied for a job in almost 18 years. What if I don’t get aninterview? What if I bomb it? What if they don’t want to hire me? Saturday is when things got fun, though. A, L and I went off early to Freeport, and as planned, A dropped me and L off at Casco Bay Fibers, around 10:30. Although this isn’t local to me (a couple of hours away), it is a wonderful LYS. L and I headed in, and A went off to Portland. I also found some beads to make another ribband necklace, so this store was a GREAT find! It took us just over an hour there, and truthfully, I could have stayed longer, but I was conscious of L wanting to go clothes shopping, and I know A has no patience for that, so we needed to get a head start! For those of yo who have never been to (or heard of) Freeport, it is a small town that converted itself into an outlet shopping mecca. It has the flagship LL BEan complex, and all the buildings in town have been converted to stores of one variety or another. I like that they did not allow much in the way of new building, so Main Street looks like a bustling New England town, but it is all facade. We went to the Gap, Banana Republic, Clark’s, Bass, before we got tired and hit Starbucks for a cooling drink while we waited for A to returns. Once she did, we went on to Old Navy, Van Heusen, and Talbot’s before lunch. L found a nice silk shirt along the way, and some great shorts at Talbot’s – much more selection there than in the Bangor store, so she was thrilled. Not sure she found anything to wear to the wedding, but she will. 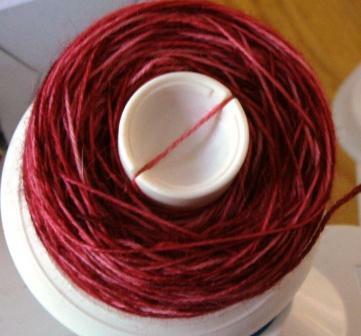 I fell in love with many things, but had blown my cash on yarn, go figure! Then we wandered out of town in the car, and found a pet store that carries grain and chicken free cat food, so we got several flavors and varieties (good news, all cats are happy to eat it). We also found the local chocolate shop and managed to get a few treats there. By then we were all hot and sick of shopping, so A drove us home the long way, with a stop in Randolph at Deb’s for homemade ice cream – yum!